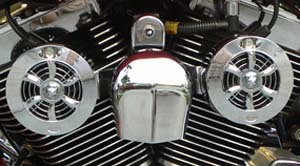 Most powerful V-Twin Cooling System! This Engine Cooling System will improve your bike’s engine heat issues, reduce oil temperature and improve engine performance. The hotter your engine, the less power it will produce. The days of rear cylinder shut down, pinging, and sluggish performance are over the moment you equip your bike with engine fan cooling. You as well as your passenger’s riding comfort is a lot more pleasant, even on hot summer days. No other cooling system is even close to the engine cooling results that these “Patented” systems. PERFORMANCE: This system is by far the most powerful and effective cooling system available. Buell engineers' quote in their US Patent application for a forced air cooling system. “The higher the volume of air flowing over an air cooled motorcycle engine, the more effective the cooling fins are at transferring heat from the engine to the air.” The more forced air that you can direct at the heat source, the more dramatic the cooling results will be. More powerful streams of air will always cool substantially better than a lesser volume of air. POWER: The most powerful, and by far the most effective, high performance, waterproof fans available. At 276 cubic feet per minute, the fans put out over twice the air as the nearest competitor. The unit is located to sit at precisely the optimum placement to concentrate the powerful air streams, at the hottest area of your engine’s cylinders. Only a two fan system can properly direct the air to the critical heat producing areas. CONSTRUCTION: Designed and manufactured to the highest quality. The body is all Aircraft quality Stainless Steel construction polished to a high chrome finish. Compare this material to others who’s body construction is either aluminum or mild steel. Although it’s more expensive, stainless steel is used because, unlike the other painted or chromed metals, it will never blister, chip. or rust. No welding is used in the manufacturing process. This is especially important considering the extreme vibrating environment generated by a Harley engine. Weld free manufacture prevents material fatigue, as well as the the failure factor common in welded parts. FANS: The most important single element in the system. The fans are twice as powerful as the nearest competitor. They are 100% waterproof. Using thermodynamic photography, along with in-shop and on-the-road testing, it was determined just how much power and what precise placement a cooling system needs to have in order to make your engine think it’s being cooled by an equivalent amount of air when standing still as it would tooling down the highway. OIL TEMPERATURE: Oil temperature is an important issue. The cooling system will lower oil temperatures, which dramatically increases oil pressure especially at idle, due to the cooler operating engine temperatures. Increased oil viscosity due to cooler oil is critical for the longevity of your engine. OEM WARRANTY: Rated for a minimum of 20,000 hours of life. Full year 100% OEM warranty on electrical components and three (3) year OEM warranty on all other parts. 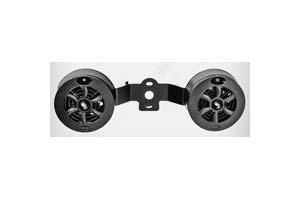 FITMENT: 2014 and newer Touring models require a Harley harness adapter to make installation plug and play. 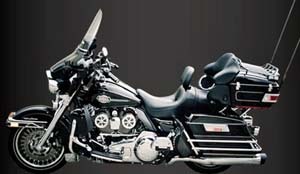 HD Plug configuration was changed from a four pin to an eight pin (Harley part # 69200722). Please read carefully before ordering! The most important detail for maximum performance and longevity is how you install them on your bike. Currently, there are four installation options. They are listed in order of desirabi lity, with option# 4 being the most desirable. 1. Standard Engine Mount: Mount to the engine via the Harley horn mounting bracket with the supplied thick vibration damper. Pros: Everything for a horn mount installation is included in our box. The average installation time is about half an hour. Cons: The Engine Fan Cooler is mounted to your engine via the horn mounting bracket. This will vibrate the most of the four available installation options. 2. LJ-VM, Vibration Isolation Mount: The Vibration Master is the most desirable option if your bike will not accept the Frame Mount Kit. 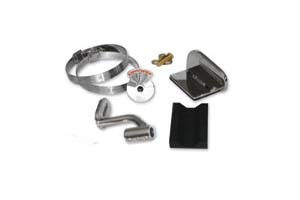 The kit an attractive and Heavy Duty method of mounting to your engine via the Harley horn mounting bracket. Two heavy duty vibration dampers encased in a highly polished Stainless Steel enclosure, replace the stock Harley vibration damper. Fits all H-D engines. Pros: A very secure mounting method that is superior to mounting directly to the Harley horn mounting bracket. Positions perfectly for maximum cooling effectiveness. Installation time is about 5 minutes. Cons: Mounted directly to the engine. As reported by our customers there is a significant reduction of vibration on most models, but it is not as effective on some bikes. 3. 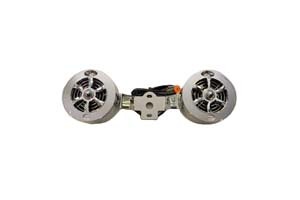 LJ-FM or LJ-CM Frame Mount: Re-locates the Engine Cooler and Harley horn assembly from the engine, and mounts it to your frame where the vibration is significantly less. The installation takes ~1 hour to complete. Pros: Just about eliminates all the vibration. Cons: Designed primarily for large touring bikes and other bikes without any obstruction between the engine heads and the frame. Some bikes have a stabilizer arm that prevents the Frame Mount application. The Frame Mount Kit does not fit all Harley Models. 4. 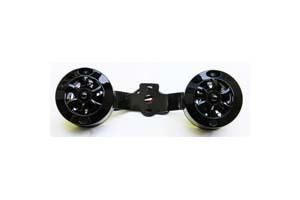 Combination Mounting: A combination of the Frame Mount Kit and the Vibration Mount Kit. By combining the two installation products, you will experience the best performing and longest lasting cooling system. Pros: Virtually vibration free environment. Very secure installation. Cons: Does not fit all Harley Models. There are literally thousands of Harley Models. Factors like the year of manufacture, frames, engines, rubber mounted engines, solid mounted engines, customs, etc. all play a role in producing varieties. Therefore, a comprehensive list of “Will fit” models for the Frame Mount Kit (FMK) is not possible to publish. Here is how to determine which mounting system works on your bike. 1. Look at your Harley’s horn mounting bracket. If you see a rod bolted to the center of the horn bracket that connects to a bracket welded to your frame, the rod is in the way of the FMK, so the FMK will not fit your bike. In that case the Vibration Mount is your best choice. Do not order the FMK if your bike has that stabilizer rod from the engine to the frame. 2. 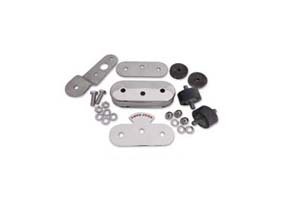 The Frame Mount Kit is engineered to fit Harleys with a square back bone frame section located directly under the tank. Using a flashlight, look at the frame that is directly above the horn, you should see a flat surface, that’s the bottom section of the square tube. (NOTE: If you see tubes to the rear of the tank, you are not looking in the right place.) These tubes are welded to the square tube section of your frame. Again, look directly above the center of the cylinders. If you have the new engine with the water cooled heads, The FMK will NOT fit your bike. Please use the Water Cooler Frame Mount Kit.